Anglicare Central Queensland is wrapping up Domestic and Family Violence Prevention Month with the AnglicareCQ Boys’ Night – a casual evening of entertainment and speakers this Friday, May 29 from 7om at Eldino’s Cafe (159 East St, Rockhampton). As the name suggests it’s targeted at men, but everybody is very welcome. The show itself is free, with live music, entertainment and guest speakers. There’ll be wallet-friendly food available to buy (including vegan and gluten free options) and the venue allows BYO drinks. 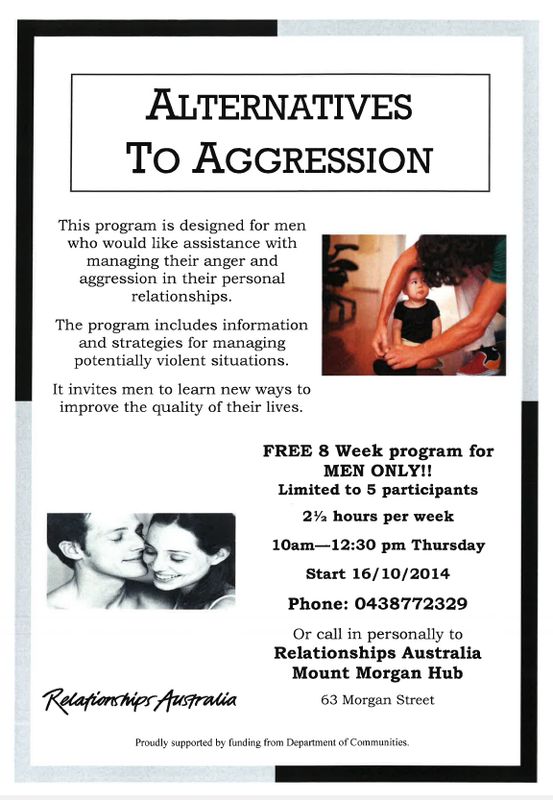 Please see attached flyer for information on Relationships Australia’s Alternatives to Aggression Program for Men. Description: This years’ theme “Innovation” will examine what sheds do on a day to day basis and focus on their future growth and development, whilst at the same time tackling the bigger picture issues such as the prevention of social isolation and engaging men within the community. Delegates will come from a broad spectrum of backgrounds, including “shedders”, shed coordinators, health and aged care professionals, educators and policy makers. Please see the attached flyer for information on the Relationships Australia “Alternatives to Aggression” program for men.